Everyone knows that China’s economy is one of the fastest growing in the world, eager for development and modernisation, fuelled by astonishing industrial growth over the last 30 years. A report I read online pitted the real growth in GDP per capita as a mammoth 270% between 1990 and 2005, whereas Britain in comparison sat somewhere way below at about 36%. To my mind that is both huge, impressive and rather worrying. Having cycled nearly the whole way across this country now, through Xinjiang, Gansu and Inner Mongolia – provinces which are playing both key roles in this development and also facing some massive environmental challenges – I have seen first hand a country locked in a battle. China is in a race with itself to balance present and future resource use with its bid to grow and improve the quality of life for its people. No easy task, though the problem is simple enough: China’s economic growth depends largely on heavy industry which is predominantly driven by coal, the nation’s most abundant natural resource. While coal availability itself isn’t a threat to China’s growth, water availability is. Coal mining and industrial use requires huge amounts of water and the country is facing a continued drop in available water sources – especially in the North, ironically where most of the coal is to be found. One quote suggested that 600 million people live in provinces with water stress and another from Circle of Blue said that since the turn of the century China has lost 350 million cubic metres of water a year, the equivalent flow through the Mississippi in just nine months. In short – Chinese energy demand and water consumption are rising, while the country is drying up. As expected, all this heavy industry and development has lead to chronic environmental degradation and pollution. Habitat loss, desertification, air and water pollution, as well as bridges buckling and roads snarling with traffic – you don’t have to look far to find a story or see the scars. So the question is: How can China balance all of these needs and address the issues in a way that provides for the future, repairs and nurtures the environment and somehow meets the expectations of its people, now hungry for continued change? Therein lies one of the most important questions of our time – not just for China, but the world, too. For this is a global crossroads, one facing each and every country – how to move forward into the future is a sustainable way. It will be interesting to see how things develop in the next ten or twenty years. From my saddle here in China, I have mixed hopes. Daily I am covered in grime from trucks and often I weave down lines of them kilometres long, all carrying coal or components to and from factories and mines. The factories and mines themselves are almost everywhere across the landscape – all leaving huge scars on the earth and belching out torrents of thick smoke and noxious gases. 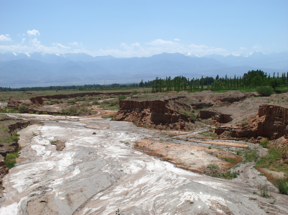 Until reaching the lower waters of the Yellow River last week, I had seen barely a trickle of moving water in the rivers for the past three weeks – most were dry river bed being scoured for gravel and mud or used as through routes. Yet the other side of these problems lies hope and tangible examples of some great efforts and solutions to the challenges facing China. 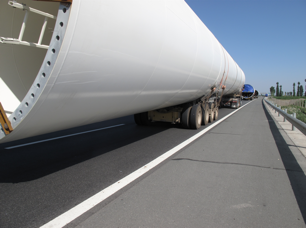 I have been overtaken lately by columns of trucks transporting huge components for wind turbines and have pedalled through wind farms nearly 100km long – the white rotors whirring in the strong winds, humming towards a future fuelled by cleaner, renewable energy. I read in China’s 12th Five Year Plan from earlier this year that it plans to reduce carbon emissions and water consumption through industry, partly by green energy solutions such as wind, solar and nuclear plants. The same goes for water shortage issues too – ten years ago the Yellow River didn’t reach the sea, but now, thanks to strict water usage quotas and some ingenious transport systems bringing water from the South, it flows into the East China Sea once more. As to the future, I don’t know where my feelings swing at the moment – I am an optimist by trade but my journey through this changing country has brought out the realist in me, too. I hope, I really hope, that we can make the changes in time and reach an equilibrium where the world is living within its means. The clock is ticking. It’s time to rethink the future and make it happen. Brilliant piece Sarah – a great read. I can identify with some of these apocolyptic landscapes when I travelled in western China a few years ago. Massive pollution and smoke, like something out of Mordor. Let’s hope that the Chinese can learn from Britain’s industrialisation mistakes. Its interesting how seeing a place from the saddle, watching the world unfold gradually makes it difficult to say anything conclusively. I had similar feelings after riding across China too. Those wind turbines were trucking past in Gansu and Xinjiang back then (there must be millions of them now). So the future isn’t necessarily too bright. Secondly, and this is often a mistake we make when we look at China; what’s driving China’s growth? Where are all the products of China’s industry going? Demand stimulates supply and production. China’s energy and water demand increases are in reality our energy and water demand increases too. @james hopes that China “learns from Britain’s industrial mistakes”. When are we going to learn that we have to limit our consumption and start living within our means, and stop exporting our environmental problems abroad? When will we learn from out industrial mistakes? Awesome piece of cyclo-journalism, Sarah. I can tell that you speak from the hard-earned knowledge of rubber-on-the-tarmac & gravel. You certainly have had your eyes wide open all the time, and not just looking down at your front tyre! Much of what you report is dismaying, but I’m cheered up to hear that the Chinese are really serious about implementing alternatives to fossil fuels where they can. Perhaps the air blowing into Thailand will be a little clearer next April. it seems the world’s change makers are hungry for money first and future generations pay later with demands for food and water as visualised in horrific scenes of mass hunger across the Earth. It is good to be an optimist because then we can hope to bring about solutions. I expect after the grime you must have used up all those Baby wipes!!! Indeed I have Susie 🙁 Next shipment to Russian Far East I think as I stupidly forgot to put them on my list for the Beijing parcel! Your Journalistic skill are exceptional, Sarah. I can’t understand why the Guardian, Times or Telegraph haven’t sponsored you. Wonderful stuff – stay safe. Great post Sarah! Good luck with the ride and do enjoy this massive country! More of a serious and troublesome perspective to your journey. Sadly, rising population has contributed to the global market crash, on top of which dwindling resources afflict the economy, raising household bills, etc. Even the most ardent of optimists can falter in face of such pogroms. Your hi-tech solution does you credit – but there are two answers: a) a worldwide policy on birth control (which obviously is now too late to implement), or b) we develop wormhole technology enabling a mass exodus to other planets (have scientists even reached an alpha stage in their research?). The latter option sounds far-fetched and pure science fiction, perhaps, but who would pass up the opportunity to explore alien worlds?! When it comes to the Eco, it’s not just a case of developing some kind of revolutionary, clean energy fusion – we must also control the rise in population growth. Our planet can only sustain so much multi-faceted pressure. Birth-rate liberalists will probably hate me for saying this, but we must be realistic for the sake of those already living, and consume resources at a steadier pace.